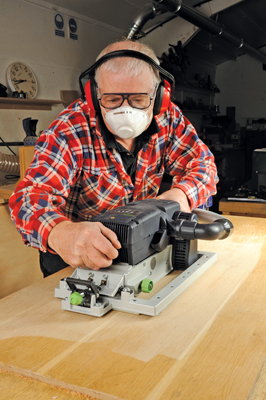 A belt sander can be seen as a pretty crude tool, but used correctly it can deliver a power of good to your work. Although big, it isn't designed or suitable for floor work for which there are far better solutions, but instead for bench use or on sturdy sawhorses. With the correct grade of abrasive and either with or without the sanding frame you can tackle anything from oak beams to unsanded veneered boards. If you have ever used a large static industrial pad sanding machine for flatting veneers then you know how easily that can go wrong and get 'breakthrough'. A large - i.e. wide - belt sander can do the same thing in a highly portable form with a bit less skill, I know, I used to use a big Makita 9401 a lot for just that very purpose. 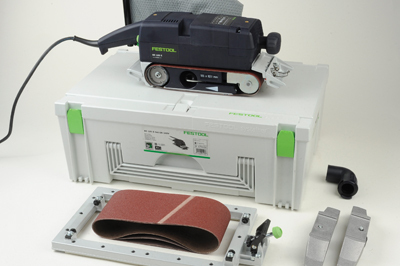 This very substantial piece of Festool kit comes in an equally big Systainer case along with various accessories. It is long and heavy and with a 105mm wide belt it is a very stable machine. 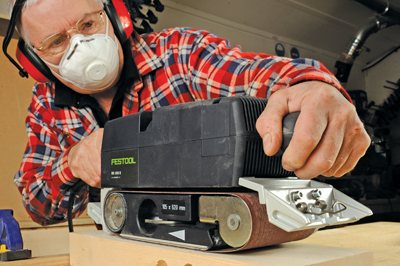 Two key things you need for a belt sander are weight and stability. If you have those it should still do the job for you, but your arm may get stretched restraining it under the load! 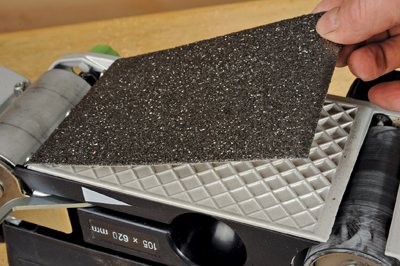 The graphite-coated, cork-backed pad the belt runs on sits over a waffle pattern base. A hook-out lever releases the belt tension to allow the belts to be fitted. Curiously the front roller doesn't turn very freely but under power it doesn't have any choice, of course. The 105 x 620mm belt size is a standard one except slightly wider than normal 100mm belts so cost or availability shouldn't be an issue. The large heavy grade plastic motor casing has the front knob and rear grip built into it. On top are the fixing points for the inversion supports and a speed guide for different materials. To the user's left-hand side is a motor cooling air spout which is directable away from your face. Next to it the extraction outlet allows a bayonet fit spout for a hose to be attached or a dustbag which has a springy anti-static arm to contact a special bare panel on the metal body side. Below that is the belt tracking knob to keep the belt running centrally on the rollers. To the rear is a fine slotted pulley drive casing. At the rear of the machine there is a small speed change knob and the sprung switch trigger and lock button. Now for the interesting bit, the sanding frame. On the sander body are two cast alloy mounting points with angled slots to allow frame connection and adjustment. In theory these two castings could be unbolted but I really wouldn't do it. The reason is evident when you see machine screws underneath with red thread lock paint dabbed on them. This is a sure sign that an engineer has adjusted both front and rear assemblies so the sanding frame will sit in place perfectly level - vital for precise results. 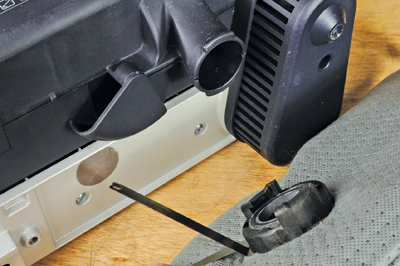 The aluminium sanding frame has mounting pins back and front that engage with the belt sander slots. At the front of the frame there is a sprung lever frame and threaded engagement toggle. 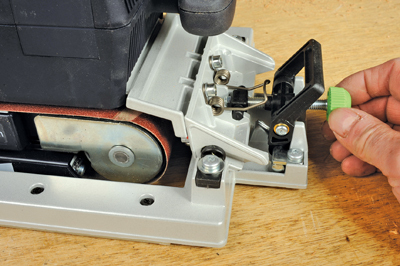 The former raises and lowers the belt sander from and to its working position while the latter adjusts the exact running height of the belt. 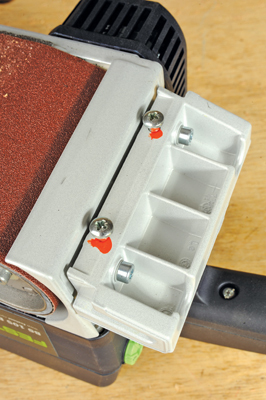 Once the sander is mounted a spring clip holds the toggle end in detents on the sander for security. Underneath the frame a series of plastic strips hold rows of tight packed black bristles so the frame rides on these not the whole surface, thus reducing friction considerably. An additional accessory worthy of mention is called a 'stopper' - side fence to you and me - this is handy for more control allowing you to work against it safely when inverted or even freehand along edges.